so said ellie: I had my cake and ate it too. I had my cake and ate it too. I have one word for you: macaron. That is all. 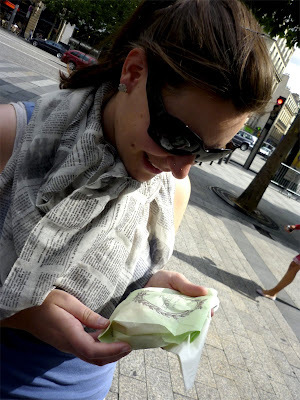 From Pierre Hermé or Ladurée, I didn't care, all I wanted from Paris this time around was to experience the macaron. 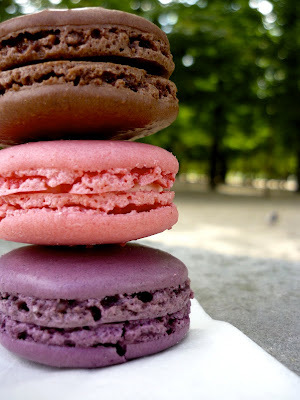 I have a theory, based on my close study of food blogs etc, that macarons are the Next Big Thing in pastry. I feel that the cupcake's time is drawing to a close. Because of their growning trendiness, slowly I have noticed macarons appearing in Sydney. But in Sydney they can currently only be found at the Lindt cafe (post script on that to come), and little pattiseries in well-heeled suburbs full of yummy mummies and dogs wearing clothes. 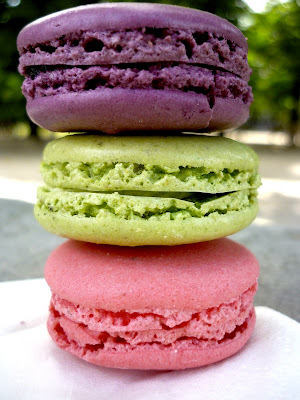 Don't be fooled by the name; a macaron is not the same as a macaroon. 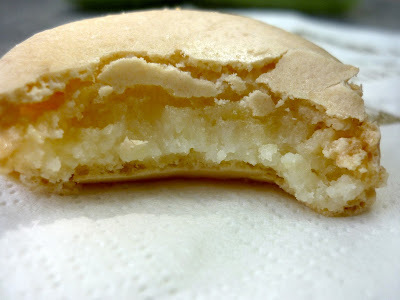 A macaroon is a stodgy lump of shredded coconut and refined sugar. 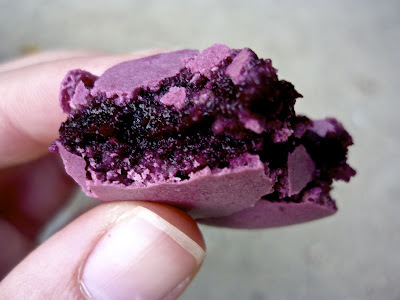 A macaron is two little shells, made from egg whites, sugar and almond meal, sandwiched together with ganache. Delectable. And definitely not stodgy. If done right, they are glossy and so slightly crisp on the outside, but inside the shell is soft and smooth and full with a little foot at the base, and blends into the ganache when you bite down. Oh my gah, my mouth waters. I'm not going to lie to you, they are sweet! 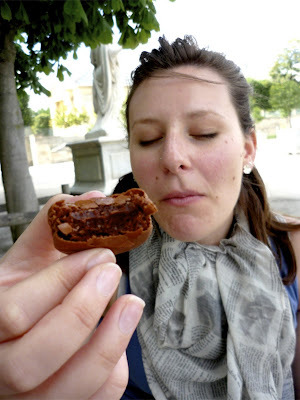 But the flavours are SO intense, and they are bite size, so somehow it all just balances out. And the colours..oh! 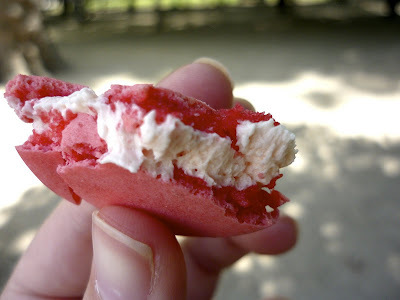 I wanted my macaron experience to be firmly planted in the "done right" category of pastry. 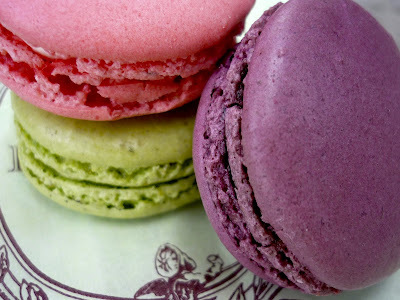 Since we were on the Champs Elysee, and unlikely to be going near St Germain, Laduree took the cake.. so to speak. I can't describe this properly. When we went into the boutique I was so overwhelmed I sort of didn't know what to do with myself. Picture, if you can, a pastry case metres long and make a third of it full of brightly coloured macarons. Make the rest of it filled with other delicious looking things and then perhaps you can understand my troubles. I didn't know what flavours to go for, so I asked the lady to pick a box of 6 flavours that she would eat and ended up with pistachio, coconut, salted caramel, rose petal, blackcurrant violet, and chocolate. 8 euros later I had my little green bag, but because I had the whole scenario planned out in my mind, I restrained myself until we'd walked the whole way down to the Tuileries and found a park bench in dappled sunlight. To my credit, I let Rob have a bite of each one. We started with the coconut. I'm not a huge fan so I wanted to get the potential disappointment out of the way first. Also, these babies are delicate, and the coconut had been a little bashed during the walk, rendering it the least photogenic of the six. Luckily I wasn't that disappointed. The chocolate was like eating a brownie, but better. Perhaps you're confused about the texture. Does this make more sense? Probably not. How about now? The blackberry, holy crap, was amazing. It was burst of flavour, tart and intense. My life changed at that moment. And luckily Rob didn't like it so I ate almost all of it! We ate all of them in one sitting. I'm not ashamed. The only problem now is that I am obsessed with them, and have neither the time nor the oven to do them justice. Last time I went to Paris I had a pretty bad time. The endless drive to do and see particular things that I had no particular interest in got old pretty quickly. Eh, and just for the record, you can buy Maille mustard in Coles in Australia. As they say though, that is a story of another time. Do they say that? I don't know. Paris had left a bitter taste in my mind. It hadn't been all that it's cracked up to be and i still think about that experience with regret, about many many things. And so, to avoid disappointment second time round, I set myself one goal only. One thing only that I had to do. I have since come to a conclusion that this is perhaps the best way to travel, sage old bird that I am. Make plans but be spontaneous. Go forth my friends, and eat fantastic things in foreign places. You won't regret it!